Bottom loading systems create less turbulence in the tank, reducing the danger of generating static electricity. Designed to provide flexible long-range operation, the heavy-duty unsupported boom type bottom loader configuration is both reliable and easy to use. A minimum of five swivel planes of rotation offer complete flexibility in making tight connections for loading and unloading rail cars and tank trucks. The outboard swivel and arm adjust for any changes in elevation or tilting that may result as the vehicle is loaded or unloaded. The unsupported boom type loader is extremely versatile and many variations are possible. It can be equipped with dry disconnect coupler, union, quick coupling, or other customer specified end fitting to make connections on the side, at the rear, or underneath the vehicle. The intermediate swivel is often 2” – 6” sizes available inverted to achieve the low profile and clearances needed to connect to the underside of a rail car. 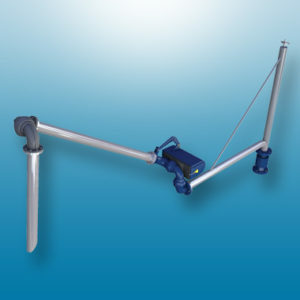 The “A” Frame Loader is a popular loading-arm configurations due to its flexibility, long reach and convenience of use. 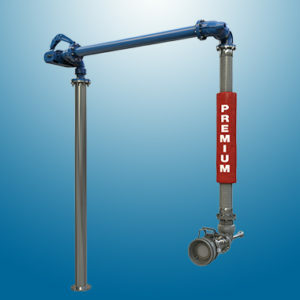 Commonly used for tank-truck bottom loading, “A” Frame arms can also be used in top-loading/unloading installations. Inlet flange and seamless piping are suitable for handling liquefied petroleum gases, including propane and butane. 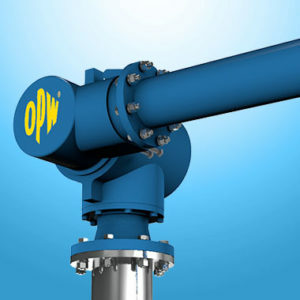 OPW A-Frame Hose (AFH) Loading Arms offer the same advantages as conventional A-Frame Loaders, except flexible hose is used instead of rigid piping on secondary/outboard arm. The A-Frame’s compact storage envelope allows loaders to be installed relatively close together, often on risers that are approximately the same height as the truck connection. AFH loaders are typically stored in an upright, near vertical position, making it possible to load from both sides of a loading bay. 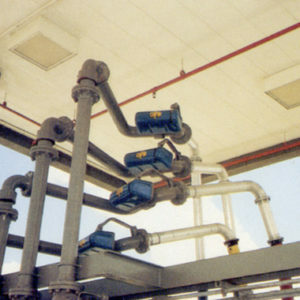 In addition to bottom-loading petroleum, the AFH is also a common choice for use as a vapor recovery arm. 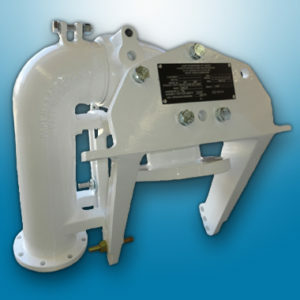 Installation and operation are simple and efficient with OPW Engineered Systems’ hose loaders. Adjustable counterweights mounted on a pair of horizontal rails are simply moved until the desired balance point is located. This design provides for efficient handling and coupling to the tank adaptors. This popular hose loader features a flange-by-flange base swivel joint for reliable performance and ease of maintenance. 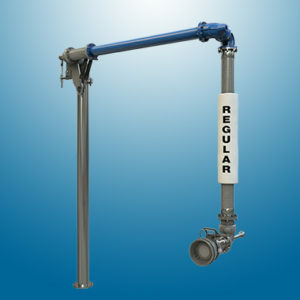 A heavy-duty Dual Split Flange (DSF) base swivel joint is standard on 4″ arms. Construction is carbon steel with a drop hose for maximum flexibility and easy handling. Coupler swivel joint, spacer spool and API coupler are aluminum on the standard model. OPW spring balanced hose loaders are available in both short-range (SRH-32) and long-range (LRH-32) versions. 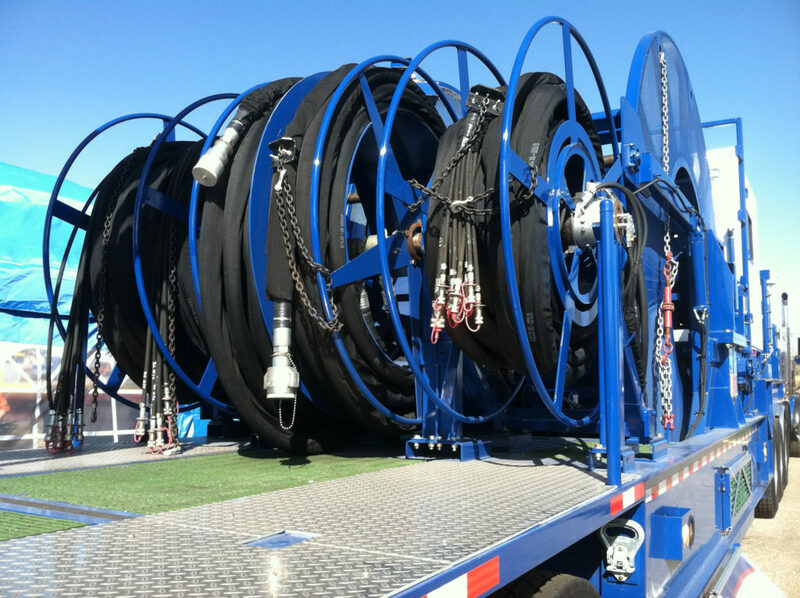 Like counterweighted hose loaders, spring balanced hose loaders are generally stored at horizontal and only slightly upward or downward movement is required to align the coupler with the tank truck adaptor. 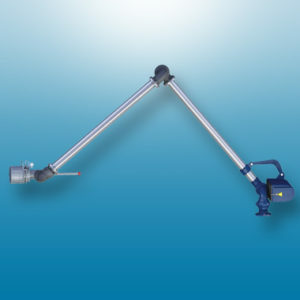 The Long Range Hose Loader, in the 4″ size, is used in exactly the same manner as the counterweighted hose loader. The major difference being the counterbalance mechanism is a torsion spring rather than weights. Easily meets API envelope requirements with 3 units on 21” (533 mm) centers. A benchmark has been set for all bottom loading arms with the introduction of the LBM800. This state-of-the-art design is essential when you require safety and long service life with minimal maintenance. The LBM800 provides effortless bottom loading in petrochemical distribution terminals through the use of the unique design known as the Velvet Touch. The ability of 360° rotation in the horizontal plane allows the LBM800 to easily move from a parked to loading position, and to service vehicles on either side of the loading bay. While the vertical plane swivel allows users to position the coupler at different heights within the API envelope. 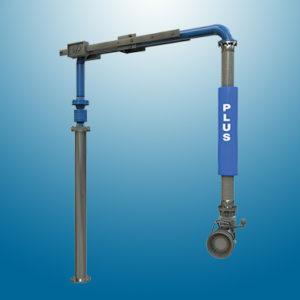 The Velvet Touch MK2 Balance Assembly has been designed for use with bottom-loading arms in petrochemical-distribution depots. The MK2 features horizontal-plane swivel capability that allows 360° rotation of the bottom-loading arm and easy coverage of the width of a standard API envelope. The vertical-plane swivel allows movement 15° above and below horizontal to satisfy various coupler-height requirements while working in conjunction with twin lift-O-mat struts, which minimizes the amount of effort required to position the API coupler. Base flange is 4" ANSI 150 raised face flange. Outlet flange is 100mm (4") TTMA pattern. Dual o-rings for product seal and dust seal respectively. Viton B70 grade o-rings (* Teflon or other special seals available on request). 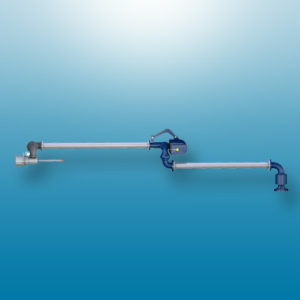 Associated Equipment See Velvet Touch loading arm systems. * Note: The nature of Teflon is that it is unyielding but easily scratched; therefore the slightest damage can lead to weeps particularly where clamping force is provided by a spring which is necessarily limited in force. However the use of Teflon cannot be avoided because of its outstanding chemical resistance. Liquip guarantee the sealing of all new products and test all production prior to dispatch. Following installation of the equipment by the Purchaser it is essential that the valve be kept perfectly clean, any test liquids be perfectly clean and no tools be allowed to touch the Teflon seals. 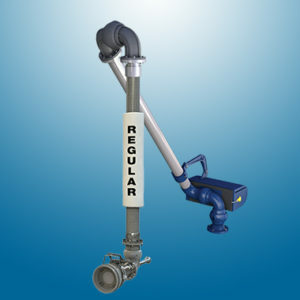 It is not uncommon for valves to exhibit small weeps once in service with commercial-quality liquids.